This is a talk by Alex Wilson on essentially all of the insulation products used in home construction. The talk covers the environmental effects in depth, and also gets into some of the usability aspects for different applications. Some of the most common insulating products (eg Extruded Polystyrene) have some very serious greenhouse gas impact and should be avoided where possible. The talk is hosted on the Building Green site and there is no charge -- I don't know how long the video will be offered. That's a great video! 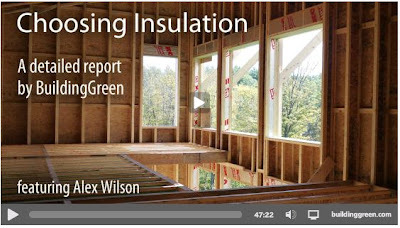 That really gives me insight in how insulation contractors do what they do and why they do it. I don't think anyone could have said it better than Alex Wilson. Thanks for sharing!